If there’s one thing that customers love, it’s great service. But delivering on the promise of great service isn’t easy. In fact, very few brands have perfected the secret formula behind it. But how can businesses deliver high quality customer service or get their customer service outsourcing companies to offer ideal customer experience? We’ve compiled some of the best quotes on customer service to shed light on the importance of customer service, what it takes to deliver great service, and how you can go about it. The whole thinking around customer service has to change. Customer service is no longer just another function. It’s no longer about merely listening to customers and telling them that you will get back with a solution. When organizations hire inbound call center services to run customer support, they need to make these vendors understand that the service they deliver is reflective of what the company stands for. In fact, after a sale, customers perceive brands completely based on how they are being served. With most businesses going digital, the modern-day customer has become spoilt your choice. 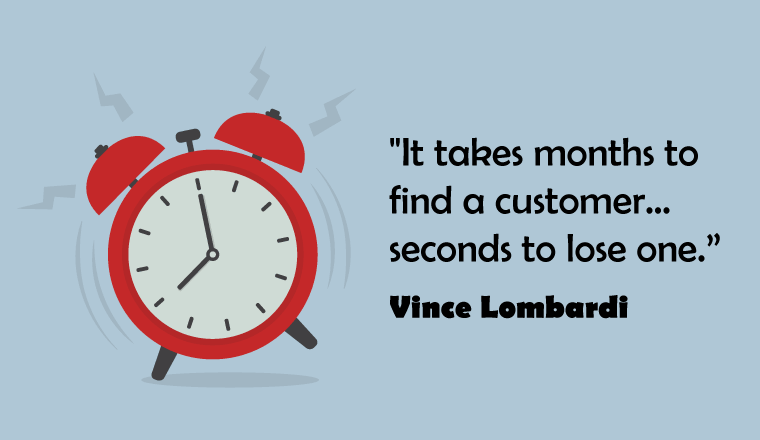 If your company’s online customer service is slow and reactive, the customer leaves you for a competitor in no time. When it comes to outsourced customer service solutions, you need to choose one that manages your online presence as well, and not just handles the call center. This enables you to stay in-sync with the digital customer and understand how their expectations evolve over time. No one is perfect. Even the most customer-centric brands have made mistakes. And guess what, customers are fine with it, as long as you provide them with an effective fix. Sometimes you just have to accept your mistake, apologize and get back to delivering great service. This is a principle that all inbound call center agents should follow diligently. There’s no publicity like great customer service. Till date, word-of-mouth remains the most effective means of marketing. If you can woo your customers with a great service experience, be assured that they will tell the world about it. The upshot is that your brand becomes more favorable in the eyes of the public and you get to cut down on unnecessary ad spends as your customers are doing the marketing for you! Customer service outsourcing companies can actually be a profit center for businesses instead of a cost center if you do it right. “You’ll never have a product or price advantage again. They can be easily duplicated, but a strong customer service culture can’t be copied” – Jerry Fritz. Well, isn’t that true? Gone are the days where you could make millions selling an amazing product. There’s no dearth of quality products in the market today. What’s missing is a great service experience to accompany it. A customer service culture that is authentic and relentless in its pursuit towards customer delight. Unfortunately, that is something you cannot duplicate. When you look for an outsourced customer service solution, go with the one that can help you maintain your competitive edge by not matching but exceeding the benchmark you have set for customer service. For customer service to put you on the path to success, the work starts from within – all your employees need to be on the same page. That includes call center agents. They need to feel like they are part of something bigger, aligned towards the common goal of driving customer happiness and loyalty. More importantly, they need to love their job. Any amount of dissatisfaction or unhappiness at work will slip into customer conversations and affect the quality of service provided. This is especially important if you work with one of the customer service outsourcing companies for your inbound call center services needs. If your outsourced call center agents don’t feel that they belong to your brand, it is unlikely that they can deliver the same customer experience as you do. Do you know what irritates the customer most when interacting with your brand’s customer service team? Unprecedentedly long wait times. Outstanding customer service is both quick and efficient. The last thing your inbound call center service team should be doing is forwarding calls or putting the customer on hold constantly. Customers don’t wait. Not anymore at least. You can get the best people, run the best service training programs and provide the latest architecture and platforms to manage customer queries, but if your team lacks empathy, you’re going to fail. At the heart of customer service is putting yourself in your customers’ shoes every single time. It’s about establishing that human connect with the customer, understanding the real problem, and looking at every query as more than just a ticket. The best of customer service outsourcing companies equip service teams with inbound call center agents who can completely empathize with the customer before proposing a solution. Let’s end with one of the classic quotes of all time. This one by Bill Gates should be up a pin-up board at your organization. When things don’t go as per plan with a customer query or complaint, there’s always a learning attached to it. Your inbound call center service vendor should be able to analyze customer interactions and present you with detailed insights that tell you what went wrong and how to rectify it. Outsourced customer service solutions need to have advanced and proactive analytics to be able to identify shortcomings in service operations and notify agents and supervisors about it on time. At LiveSalesman, our customer service agents are trained to be problem solvers, instead of just answering agents- a major differentiator that sets us apart from other outsourced call centers. We focus on building long terms customer relations that automatically translates into repeat business and higher share of wallet for your company. We offer Multilingual customer support in over 30 European and Asian languages including French Customer Support and Spanish Call Center Services. If you are looking to outsource customer support, get in touch with us today.